The following letter from the representative body for self-builders (IAOSB) to Senator Paschal Mooney takes issue with a reply the Senator received from Minister Phil Hogan. Senator Mooney had written to the Minister, on behalf of self builders, following a complaint made by the IAOSB regarding statements made in a Senate debate in April 2014. In the following letter it appears that the transcript of the Seanad debate was edited and omits specific references made by Minister Hogan concerning the IAOSB in the Seanad. Firstly I would like to express our thanks to you on behalf of all of our members for taking up the issues we raised directly with Minister Hogan. We are a voluntary body with scant resources to pursue these matters. We remain astonished at the contradictory replies in the Seanad and now in Minister Hogan’s letter reply to you. We previously had tabled our concerns in a letter of 11th April directly to Minister Hogan also. 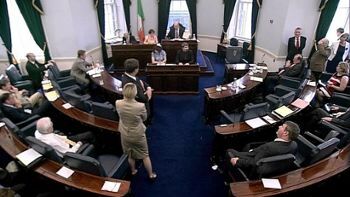 In the Seanad Minister Hogan clearly mention us, and that we had participated in the formation of SI.9. In his reply to you on 3rd June Minister Hogan goes on to contradict that. We repeat our request for an independent inquiry into the Minister’s misrepresentative comments and now contradictory statements concerning the IAOSB involvement in any stakeholder process. We are outraged that an elected representative can clearly issue contradictory and misrepresentative comments concerning a voluntary organisation such as ourselves. Due to conflicting Ministerial and Department statements concerning the status of self-builders and conflicting advice from local authorities, we have left it to the judgement of our members to read all relevant information for themselves and make decisions on whether or not to proceed with self-builds now post implementation of S.I.9. We have repeatedly asked for formal legal confirmation of the status of self-building now under the new regulations, both from the Minister and the Attorney General. We would urge the Minister if he has received this legal opinion to provide our members with this as we do not have the resources to commission a senior council opinion. The matter of the register of professionals, the monopoly on the new roles in the building regulations, is not new. The Minister himself referred to “cartel” or monopoly practices in the Dáil in a recent debate called for by Mick Wallace, TD. He brought the exclusion of Architectural Technologists (in our opinion unfair exclusion) to the Dáil recently. Minister Hogan is well aware of this issue having taken Minister Gormley to task concerning Architectural Technologist exclusion from the register when in opposition some years ago. The increase costs as outlined in our letter to Minister Hogan, up to and in excess €40,000 for a typical home are accurate and reflect the experience of a large number of our members. The costs range frequently stated by he Minister of between €1000 and €3000 is simply not correct. In his reply to you the Minister reiterates that it is incorrect that a building owner may not assume the role of builder under SI.9. Has the Minister obtained clarification form the Attorney General that this is the case? Or is this just an opinion of his senior civil servants on this legal matter? We know, from a reply we received from the Law Society, that the Law Society, remarkably, was not consulted by the Minister or Department on SI.9. We would have assumed that conveyancing and the multitude of consequences following on from SI.9 for the sale and refinance of a property, would dictate that the Law Society be a key stakeholder in the formation of any legislation? Apparently not. As a result every self-builder that takes the Minister’s statement at face value and commences a self-build after 1st March is taking a huge risk that there may be conveyancing an re-financing issues down the line. In an R.T.E radio programme Joe Duffy asked the question will the Minister and his Department come down to the high court with self-builders to sort out these issues when they occur? These are the major concerns that are effecting our members. In his reply the Minister seems to be putting the mandatory register of contractors on the long finger. This makes absolutely no sense as we now have a construction industry where everyone is “registered” except for one group that needs to be- contractors. The frequently quoted rationale of SI9 is to rid the industry of the cowboys. Unfortunately a statutory register of contractors, within a system of self-certification, will put the ban of self-building firmly on a statutory footing. Again a symptom of the flawed logic behind the new building regulations. Regarding the UK system proposed, a system of independent local authority inspections, we are all aware that this probably will cost the consumer. No one including our members, professionals or others involved in construction object to reasonable costs for an improved system. What we do object to is vastly increased costs for a system that offers no additional consumer protections, just additional “red tape”. In the UK independent local authority inspections allow for self-building, and this is one sector of the residential market which has received significant stimulus funding. The recent re-occurrence of pyrite in the construction sector is proof enough that the current system of self-certification, hands-off low cost limited local authority inspections and enforcement, simply does not work. We disagree with the Minister’s interpretation of the Law Society Conveyancing Committee advice to professionals not to undertake certifier roles for self-builders: it’s pretty clear that is what they are saying in black and white (See attached). Our members can’t get professionals to certify self-builds where the owner isn’t an experienced construction professional or builder. This places self builders in the position that they have to use a building contractor or abandon the project completely. Producing vague, undefined legislation in a premature fashion with no local authority additional resources to police, monitor or operate is not acceptable. Leaving up operation of new laws “…to the professional judgement..” of professionals and builders with clear vested interests is not acceptable. These representative bodies and organisations, when asked by the IAOSB, refer us back to the Department of Environment, Community and Local Government. In fairness to the C.I.F they have been the one organisation with clear unambiguous advice to self builders – that it is no longer possible under S.I.9. Passing the buck must stop. The Minister must take responsibility himself for the mess he has created and start cleaning it up, starting with the self-builders. Once again I thank you for all your help and assistance regarding this very important matter.